As I suspected, my mother-in-law's surgery has been canceled today. I'm relieved, mainly because I truly don't think she could have sustained the operation and was not properly prepared for how brutal this procedure would have been. However, it was canceled because the cancer has spread beyond her jaw bone and possibly into a nerve that leads to her brain. It's all very sad. Regardless of how this woman has treated me (and others) in the past and the way she lives her life, it's just an awful experience to not only be witness to, but to be playing such a large role in. Steve's dad didn't have much information when they called him (while I was in the air) on Monday. He did say that Kathy was extremely relieved to not be going through with the operation and was in surprisingly good spirits despite the news. Personally, I don't think the news has set in; once it does, I fear Kathy will go downhill very quickly. Today, instead of surgery, I'm accompanying Steve & Kathy to an appointment with a radiologist and her oncologist to get a better idea of what's going on, what the treatment plan in and what kind of a timeline we're talking about here. I've had a hard time getting back into the swing of things since returning home from NYC and plan on turning things right back around and planting myself back on the no eating out train beginning tomorrow. In between the two appointments and the doing things for others, I'm going to go to the Farmer's Market and Trader Joe's to stock up on food so that I'm better prepared to take care of myself. On an entirely different note, today I'm celebrating my 10-year friendiversary with three of my closest friends in the entire world. It was 10 years ago today that I flew out to California to take part in a student exchange program and met three people that have absolutely changed the course of my life. Tonight we're going to our old hangout to celebrate and enjoy each other's company. 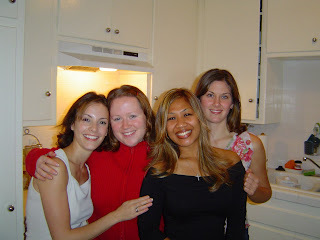 Here are a few great pictures of us throughout our decade long friendship!